"In 1984, using himself as a test subject, a brilliant researcher in New Jersey solved the riddle of why dieting doesn't work while permanently dropping 40 pounds himself. He then proceeded to help thousands of others do the same. Over the years, his remarkable findings were lost in the noise of a gigantic weight-loss industry intent on making money from chronic dieters. Now, finally, this landmark solution to permanently losing weight is available again . . . "
"If every overweight patient learned all of the lessons in this magnum opus, the success rate in treating their obesity would be dramatically improved." The first rule of losing weight: forget about losing weight! If you're someone who would like to weigh less but have not been able to achieve it, this is a book that may change your life. 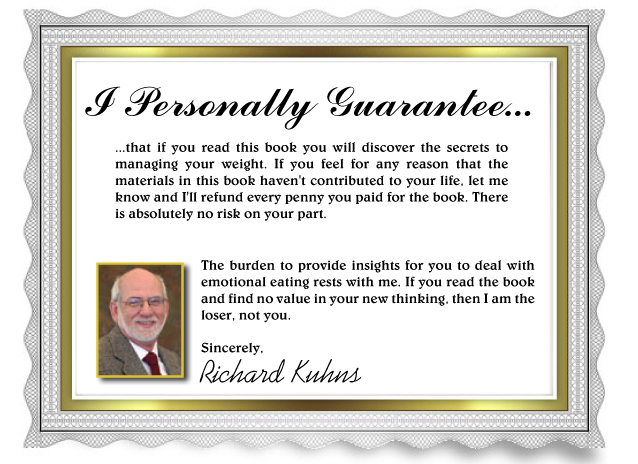 Richard Kuhns was the first to describe the three kinds of eating that cause weight gain: habitual, emotional, and self-defeating. He proved that by simply identifying and addressing which of these you're doing, you'll watch your weight begin dropping on its own. No craving, starving or suffering. No drugs, calorie counting or yo-yo dieting. Kuhns' insights have been obscured by a multi-billion dollar diet industry bent on making money. An industry that's actually DEPENDENT on the fact that diets don't work. After all, if people actually kept the weight off, where would the industry be? AND FINALLY ACHIEVE YOUR REAL WEIGHT! 1. A FREE copy of the ebook when you order the paperback – so you can start reading right now, and share with friends! 3. Melonie Dodaro's "Why You Can't Lose Weight"
4. 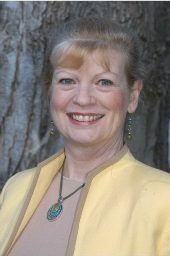 Kathi Casey's "Top Twelve Stress Busters"
Twelve simple techniques that easily fit into your busy schedule, don't cost a penny and take very little time - a must have in today's fast paced world! Stress is inevitable, but you can learn how to change your reactions to stressful situations and find some peace and calm in the storm. As a special bonus, Kathi has included all 4 of her guided relaxation meditation tracks as downloadable MP3's. With four different time options, these lovely and relaxing meditations will help you relax anytime you need it and enjoy a more restful night's sleep. "Richard Kuhns shares all the insights necessary to easily develop thin eating habits. He is not a stuffy academician, but a reformed 'fatty' himself." Two revolutionary things about the Kuhns method – and why it works. You might ask yourself: isn't it old news that the mental part of trying to lose weight is critical? Is that all this is? As mentioned above – Kuhns was the first to differentiate the THREE types of unhealthy eating, and shows you clearly how to attack and eliminate each at its root, without the agony of dieting. Unlike everyone else, he doesn't direct you try to fix the causes of emotions that lead to overeating (stress, marriage, kids, job, etc.). He deals with the emotions themselves. You don't have to fix your life just to lose weight! builds your Self Esteem and Confidence. crispy, creamy, tasty, healthy, hearty, no-diet diet"! You already know what a HUGE difference being thin will make in your life . . . But the sad truth is, people have been dropping weight for decades and feeling good about it. Then gaining it all right back. In fact, statistics prove that a whopping 95% put the weight back on. Why? It could be a vacation. A stressful event. Or just boredom. They're simply not equipped to deal in an ongoing way with the emotions that lead to overeating. 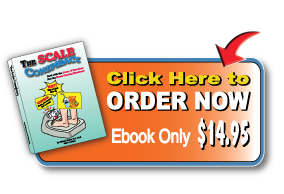 The Scale Conspiracy is a precise, step-by-step road map that will help you end binge eating to achieve a sleek, attractive physique. You'll do this by recognizing the three distinct different kinds of "bad" eating – habitual, emotional, and self-defeating eating – and eliminating whichever one(s) you're doing. As you quickly consume this easy-to-read book, you'll understand immediately how to get a handle on these three forms of "bad" eating. You'll find that you will eat everything you really want, but amazed to learn that you'll fill up on flavor and taste and consume far less in quantity than you ever dreamed possible. You'll be able to stop your overeating in its tracks, and watch the weight drop off painlessly! Emotions have been with man from the beginning, yet little is known about how to effectively deal with them. In fact, rather than knowing how to handle emotions, most of us have learned how to avoid uncomfortable emotions, or pretend that they simply aren't there. This being the case, it only makes sense that food becomes a pacifier. In order to successfully experience weight loss motivation, you must find a way of handling your unique set of emotions that cause you to eat. For some that means learning to handle disappointment; others happiness, frustration, boredom, depression, or some other emotion. It's just not enough to follow the old advice and try to control the stress that causes emotion. If you're thinking, "But I've read a dozen of these 'get excited and lose weight' books before," and have been on million diets, think again! Most programs to help people lose weight take the wrong approach! 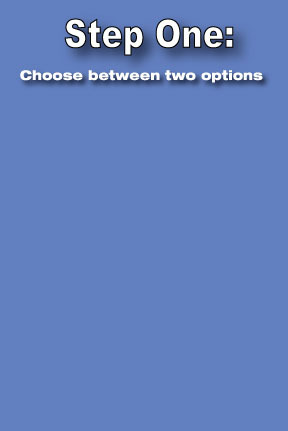 • Treating all bad eating habits the same way, not realizing that there are three distinct types; each must be addressed differently. • Attempting to deal with the stressor that causes the emotion rather than the emotion itself (a huge difference in approach). 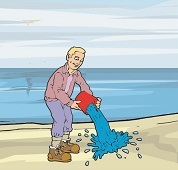 In fact, dealing wit h the stressors that result in emotions is like trying to empty the ocean with a bucket. • Making the overweight person feel guilty and "less than." • Never focusing on the building of true self esteem, but instead linking self esteem with weight. • Never providing methods of dealing with self sabotage. • Telling you that won't desire food, won't want desert, won't be hungry, or will enjoy your diet. • Telling you that sticking to your diet will give you great pleasure. • A habitual eater who eats out of habit. • An emotional eater who uses food to deal with depression, boredom, frustration, etc. • A self-defeating eater who is afraid of not living up to his/her expectations, and uses food to dilute those fears rather than face them. "You can rest assured that these insights came not from an "Ivory Tower" researcher but from an individual who understands the problem of over eating from having been there himself..."
"It's not an approach, it's The APPROACH"
"My friends hate me because they're getting fat on all the food I leave on the plate." "You don't recognize me, do you? I came to you three years ago and got rid of 110 pounds since then." "I want to thank you for your book "Scale Conspiracy". I have just finished reading it for my first time. Your no nonsense approach to emotional issues is so down to earth. I have read many self help books and yours is very simplistic, yet such profound information. I have always felt like life should be handled in a simple way, as we tend to complicate things along the way. When we complicate things, we get stressed. Reading your book has helped me to put this "simplicity" back on track. Now I realize why nothing I tried in the past worked, but I know this will because this was my answer to the "why" and "how" questions that has been on my mind for weeks now." "I have been listening to the tape as I sleep at night and have lost 12 pounds in two weeks! I have co-workers who don't believe me that it works but I am a total believer. I have noticed little things changing like wanting a glass of water when I wake up each morning. There is no other explanation as far as I'm concerned. The skinny book is giving me motivation. Now I look at shedding pounds not losing weight. It also allows you to relate to what your mind set is on food and how to control it. Why are you really eating? Are you hungry? Most times I am not. I think the skinny book gives you insight to putting out positive energy and attitude and if anyone is sending you negative energy---don't let them. You have the power to control your own destiny and get SKINNY. Read the Skinny book.